1.Firstly make the BBQ sauce, place the onions and garlic in a large saucepan with the olive oil and cook over medium-low for approximately five minutes until lightly golden brown. 2. Add the bourbon and give it 30 seconds to warm through, then carefully set it on fire using the gas flame or a lighter. This step will burn off the alcohol but leave the delicious flavor of the bourbon. Stand as far back from the pan as possible while doing this because the flames can get quite high and you don’t want to burn your eyebrows off! 3. Add the vinegar, water, red wine, tomato paste, Sola sweetener, and spices, and bring to a boil. Reduce the heat to a slow simmer and continue to cook (stirring regularly) for 25 minutes until the sauce has thickened and looks rich in color. 4. Remove the saucepan from the heat and use an immersion blender to purée the sauce until smooth. 5. Use immediately or store in the fridge for up to two weeks. 6. Next, make the ribs, preheat the oven to 300F/150C. Line a deep-sided baking dish, large enough for the ribs with foil. 7. Cut the ribs into smaller pieces––I like to cut them so that each portion has two bones, but you can cut them smaller or larger if you like. Place the pieces into the baking dish. 8. Drizzle a little olive oil over the ribs, sprinkle generously with the spices, mustard, and seasoning, then use your hands to rub the seasoning into the meat, place the star anise in the pan under the ribs. 9. Cover the baking dish with foil and place it into the oven to cook for three hours. During this time the meat will become incredibly tender. 10. After three hours, remove the ribs from the oven, discard the foil, drain any excess juices and fat off, and spoon the BBQ sauce over the ribs. Place them back into the oven, uncovered, to cook for another hour. 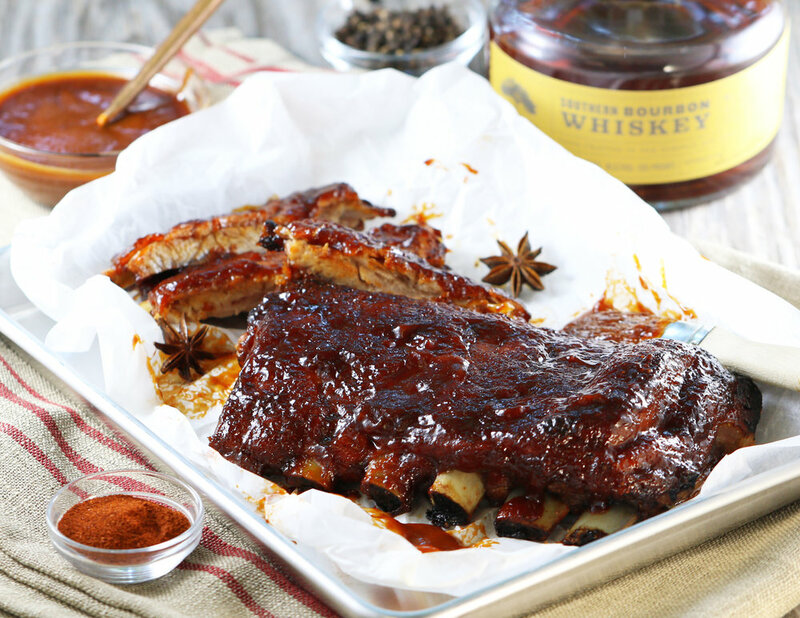 During this time, regularly turn the ribs to ensure they are fully coated with the BBQ glaze. You can also finish the ribs on the grill. 11. Serve the ribs immediately! Pair with creamy coleslaw and a fresh side salad, and don’t forget the napkins! If you don’t have any bourbon or don’t want to add it to the BBQ sauce, simply substitute with water, don’t worry; this recipe is still good without it.